Tranquility Base transformed: Teaser for "Transformers: Dark of the Moon" reveals an alternate Apollo 11. Inthe teaser trailer released last week for the upcoming film"Transformers:Dark of the Moon," director Michael Bay rewrites the history of thefirstmoon landing. Apollo astronauts Neil Armstrong and Buzz Aldrin are senton amission that takes "a giant leap" beyond collecting rocks andplanting the American flag. 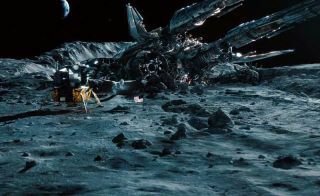 According to the previewfor Bay's third filmabout "robots in disguise," while everyone thought the astronautswere exploring the moon "for all mankind,"they were really offdiscovering a crashed alien spacecraft. Butthat's not all Bay did to transform Apollo. Although the teaser is onlyabouttwo and a half minutes long, it packs in a surprising number of changesto howthe 1969 moon landing ? and to quote the trailer, "a generation'sgreatestachievement" ? was accomplished. Withinseconds of touching down on the moon on July 20, 1969, Armstrong ? therealArmstrong ? gave the Apollo 11 landing site its name. "Houston,Tranquility Base here, the Eagle has landed," radioed the Apollo 11commander, borrowing "Tranquility" from Mare Tranquillitatis, or theSea of Tranquility ? the area on the moon where they landed. Backon Earth however, flight controllers did not know exactly where thelunar moduleEagle now rested. They tasked Michael Collins, who was orbiting themoon aboardthe command module Columbia, to try to spot Eagle as he flew over buthe wasmoving too fast and was unsuccessful. Itwasn't until the mission was over that the exact location ofTranquility Basewas determined, based largely on the moonwalkers' description of thearea,their photographs and their spacecraft's telemetry. Onething that Mission Control could be certain of though, was that Apollo11 wason the side of the moon facing the Earth. Had they landed on the farside ? theside that always faces off into space due to a peculiarity about themoon'sorbit ? all communications between Earth and the astronauts would havebeen cutoff. Therewere no communications satellites orbiting the moon that could relaythemoonwalkers' voices and television broadcasts once they were out of theline ofsight with the Earth. InTransformers,the location of Tranquility Base is even less clear. "Apollo11 is on the far side of the moon," reports Walter Cronkite, in a CBSnewsclip replayed during the trailer. "Neil,you are dark on the rock," radios an unidentified man from what appearstobe a back room at Mission Control in Houston. Whatfollows is a scene showing Armstrong and Aldrin departing the vicinityof theEagle lander, bounding over a boulder-strewn ledge of a crater toexplore thecrash site of a clearly alien spacecraft. Awide shot reveals the Earth in the black sky above. Sowhere exactly were they? Did they secretly land on the far side of themoon? Orwas Bay trying to depict a real nearby crater (though not as close asdepicted)? AsApollo 11 was the first attempt ever at landing men on the moon, NASAsoughtout an area that was geologically interesting but devoid of majorobstacleslike craters and boulders. Inreality, as Armstrong was piloting Eagle to a landing, he considered asitenear the northeast slope of a large rocky crater, which they had dubbedWestCrater during training. But the area was surrounded by a large boulderfieldand it would have required Armstrong to stop their approach short,neither situationideal for a safe first landing. Ultimately,Armstrong piloted Eagle over another, smaller crater (Little WestCrater)before touching down at what would become Tranquility Base. Butwhat of the trailer's mention of the far side? Fromwhat little it shows, that appears to be a cover story. A flick of aswitch ina Mission Control back room seems to take Armstrong's and Aldrin'svoicetransmissions to an encrypted channel. Meanwhile, the rest of the worldthinksthere has been a loss of communications. "We'venow had confirmation of loss of signal from Apollo 11," reportsCronkite. Andhow did Bay get Cronkite, who passed away in 2009,to help change history?Easy ? he didn't. Thetwo clips from Cronkite's news reports did actually air in July 1969but wellbefore the landing as Columbia and Eagle passed behind the moon toenter lunarorbit. Click through tocollectSPACE.com to continuenitpicking and to watch the teaser trailer for Transformers: Dark ofthe Moon.